Kaito just introduced a pocket sized DSP based MW/SW/FM receiver with some interesting features missing in other SW receivers its size. I just got my hands on one for the first time a couple of months ago and am getting familiar with its features, performance, and quirks. 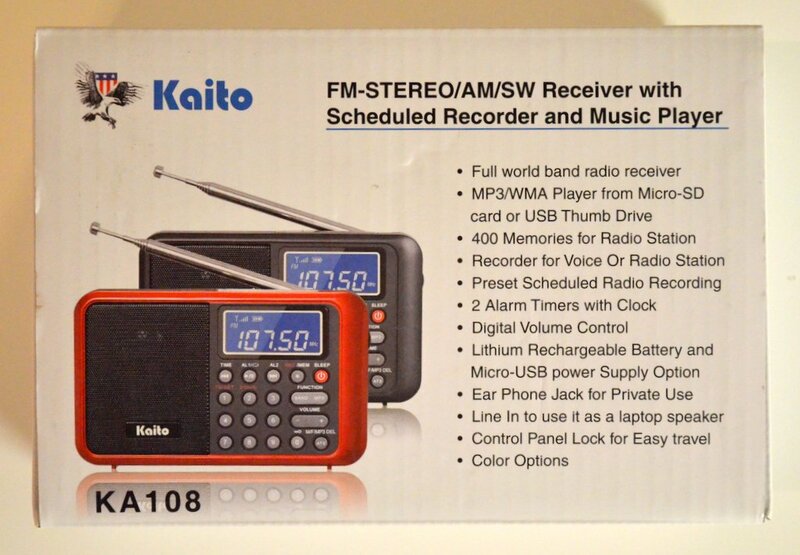 I first saw the KA-108 at the Consumer Electronics Show in early January when I visited the Kaito booth and spoke with Walter about their newest radios. 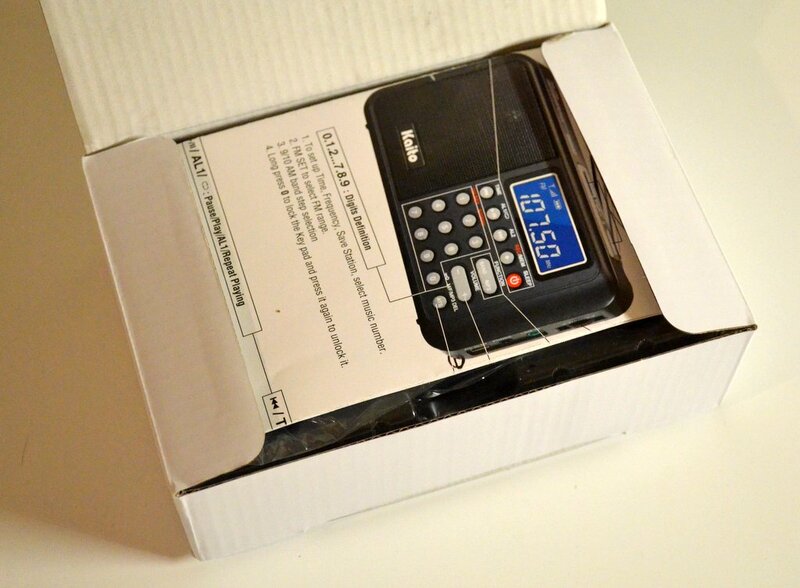 There are no schematics included with the KA-108 and I haven’t cracked open the case but based on the functionality, size, and price point it appears that the KA-108 utilizes the now common DSP based receiver architecture found in most of the new portable radios. First of all, a brief run down on the features and functions of this compact little radio. Standard USB port that accepts a thumb drive. 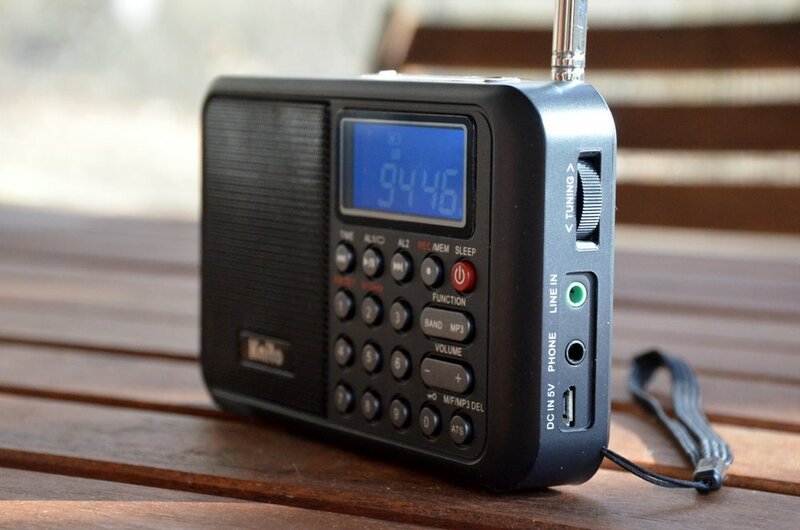 This radio is small and lightweight which makes it an ideal travel radio. The control layout features a full keyboard for frequency entry as well as up and down keys that will search for signals when held down. The fit and finish are excellent and the keys have good positive tactile feel. There are two rocker switches, one for volume up/down and the other for band/mode selection. The radio comes with a decent user manual and quick start guide. The manual’s English is a little awkward in places but is fully understandable. The backlit LCD display is brightly lit with large white numbers on a blue background. It is easy for older eyes to read, even without glasses. The signal strength meter is actually fairly useful which is rare for radios at this price point. The standard frequency step is matched to channel spacing for the band in use with exception of the FM band which tunes in 100 KHz increments instead of the US standard 200KHz steps when the frequency range is set to the North American band. The FM band can be set up to tune all the way down to 64 MHz if desired but since TV has migrated from analog to digital the usefulness of that coverage is minimal for North American users. AM is 9 or 10 KHz step capable with a frequency range to match all parts of the world. In addition to the standard frequency steps, the thumbwheel encoder can be used to fine adjust the frequency between the standard increments in 1 KHz steps. One feature I really like is the rotary tuning thumbwheel encoder on the side of the radio. It has a light detent feel that allows you to manually tune the radio in 1 KHz steps to easily allow you to move to one side of a signal. Frequency entry via the numeric keyboard is straight forward and intuitive with exception of the non-standard location of the zero key to the right of the bottom row of the numeric keys. The FM reception is excellent with bass response that makes you wonder how such a mellow sound comes out of such a small box. Despite the 1.5” speaker, the audio has lots of bass and lacks the “tinny “sound of most travel portables with small speakers. It plays loudly without distortion. I never thought I would complain about a portable receiver with a “too tight” a bandpass filter but the KA-108 is a first. The bandpass filter for MW &SW are extremely narrow which when coupled with the KA108’s exceptionally strong bass response, reduces the intelligibility of the received audio on the MW and Shortwave bands. I have been able to mitigate the situation a little bit acoustically by covering a portion of the speaker grille with my hand or placing a small tube in front of it which seems to attenuate the bass and improve the overall audio response but the audio is still lacking in the higher frequencies that make things like music and the human voice more intelligible. I found a few buzzes and whistles on the MW band and you can hear the CPU clock oscillator strongly at 12MHz. I haven’t looked inside of the radio yet but I would imagine that some of the MW noise can be tamed with a bit of internal shielding. I also found the AGC setting to be a bit too abrupt, jumping up and down in almost a step function with a signal whose level was fluctuating quite a bit. That’s another minor software adjustment to consider for the next edition. Due to the KA-108’s small size, the whip antenna is rather short (only about 20”) which means the front end must have a lot of gain leaving it more vulnerable to overload. I was able to receive a the stronger SWBC stations while sitting in the middle of my house but I also heard another faint signal under the SW stations. The interfering signal turned out to be a local 1KW AM station on 145o KHz whose transmitter is about 4 miles from my home. It was present in the background while listening to SWBC and was heard standalone on its 2nd and 3rd harmonics which were most likely generated internally due to the high gain front end. The short SW antenna does create the need for higher front end gain but should be accompanied by a high pass filter behind the SW whip antenna or at least a 10dB attenuator. Either or both of those features would reduce AM BCB intrusion while listening to SWBC. In the coming weeks I’d like to do some parametric measurements on the KA-108 and will also see how it behaves with a longer antenna and antenna tuner with low pass filter ahead of it. That should be a good test to see if a simple filter can eliminate the AM intrusion. Improvements to widen the AM/SW filter bandwidth and reduce the AM overload should be high priority improvements for the next version of the KA-108. 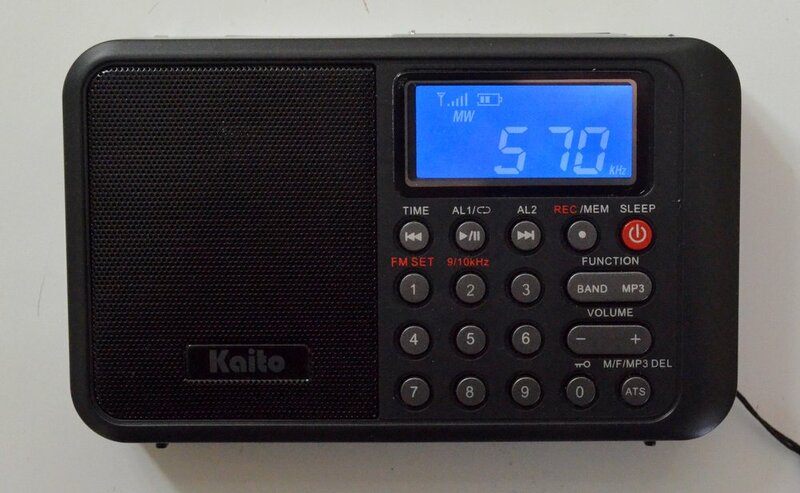 I found the KA-108 easy to operate as I’ve explored the AM/SW/FM and MP3 operating modes and it’s a nice sized radio for casual listening when I’m at home or to take with me as I travel for use as an alarm clock, music player, and radio in one compact package. The KA-108 has potential with a few software and hardware tweaks. Fixing the MW/SW bandwidth is #1. A simple high pass filter that rolls off just above the AM broadcast band behind the SW whip antenna is #2. I can live with a few buzzes and tones but why not fix them with a little inexpensive shielding while adding the other fixes. The KA-108 will never match the performance of tabletop or lunchbox sized portables, but if you’re looking for a nice little radio that will almost fit in your shirt pocket with nothing more than a micro USB cable to tote along for battery charging, and a radio that sounds twice its size, this radio fits the bill. I hope that Kaito will address the issues I’ve noted with future software/hardware revisions to improve the performance of the KA-108 and maybe even offer a way for current owners to field upgrade their radios. That’s a thoughtful and fair assessment of the Kaito KA108, Paul. It’s a reminder that, with a few strategic tweaks, the KA108 could be a great little portable. Thank you for sharing your review with us! This entry was posted in AM, FM, Guest Posts, News, Radios, Reviews, Shortwave Radio, Shortwave Radio Reviews and tagged KA108, Kaito, Kaito KA108, Kaito KA108 Review, Paul Dobosz (K8PD) on August 4, 2016 by Thomas. 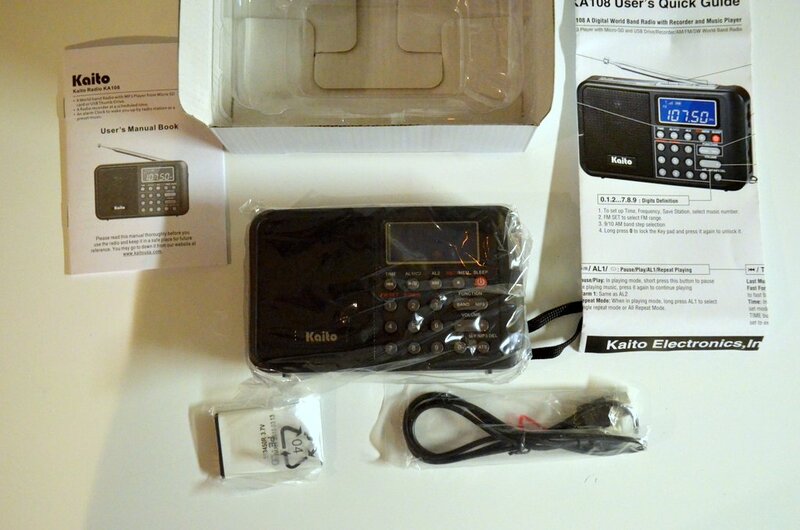 Recently, I learned about a new portable by Kaito Electronics: the Kaito KA108. While there are a number of compact portables on the market, the KA108 really caught my attention because it features a built-in digital recorder. Which is to say, you can listen to a station on shortwave, press a button, and the KA108 will record it to a MicroSD card. Pretty cool, right? It’s also the first shortwave portable I’ve ever known that offers a scheduling feature for recordings. In the past there have been a few shortwave portables with digital recording capabilities, but most of these have been plagued with poor performance. So this time, I had my fingers crossed that Kaito might have produced a winner. Having used the KA108 for several days now, my initial review follows, with a focus on shortwave as well as mediumwave performance. The KA108 actually ships with two manuals: a quick start reference guide and a proper highly-detailed user’s manual. The manual is written in English and is quite descriptive, despite a number of spelling and grammar errors that should have been caught before going to print. It’s obvious that Kaito didn’t hire a native English speaker/professional editor to check their copy. (I don’t understand why a company would go to the expense to produce a manual without having it professionally edited…Kaito, please take note!) Fortunately, these spelling and grammar errors, while annoying, can be overlooked and/or deciphered by most English-speaking readers. 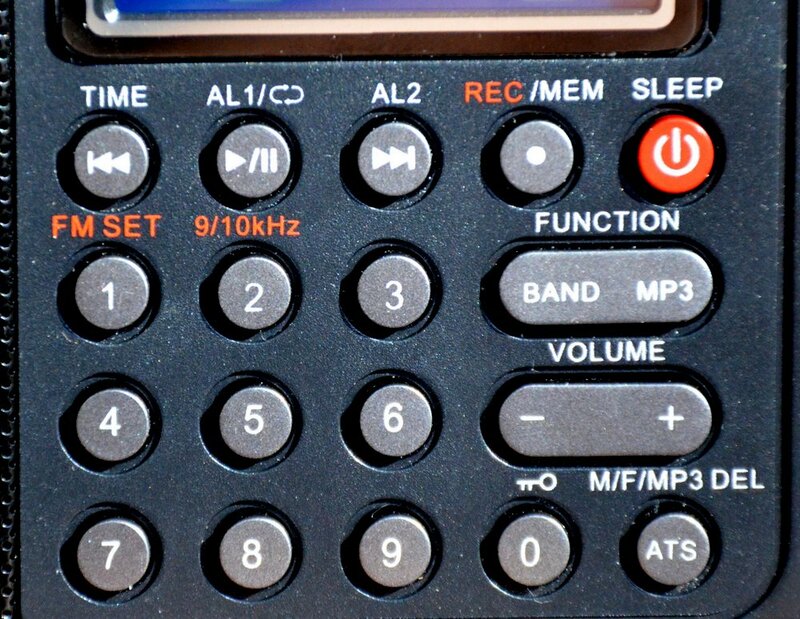 On the plus side, the KA108 sports a full number keypad for direct frequency entry. This makes tuning to a known frequency a very simple process––with one exception (see below). There’s also a tuning wheel on the right side of the radio. Note where the “0” is placed on the keypad: why the change? Using the keypad requires some getting used to, however. Most of us––myself included––are familiar with traditional numeric keypads, but the KA108 inexplicably changes the game plan: as you can see above, the “0” button is located on the lower right side of the main keypad. So it took me a few hours of use before I could reliably key in a frequency without looking at the radio. In my humble opinion, Kaito should have moved the number pad up one row, positioned the “ATS” button to the lowest row on the left, the “0” button to its immediate right, and completed the bottom row with the “Rewind/Play/Fast-Forward” buttons. The KA108 is designed around a very innovative small speaker with an acoustic chamber that significantly boosts bass response. This is the same speaker used in the Melson S8 that I reviewed some time ago. The audio fidelity is excellent on FM, and when playing back a full-fidelity digital recording. Unfortunately, when tuned to the AM broadcast (mediumwave) band or to the shortwave bands, the KA108 falls short; the bass response actually becomes an impediment to listening. In a nutshell: the KA108 audio has issues. A further explanation of the KA108’s audio is described in the performance notes that follow. 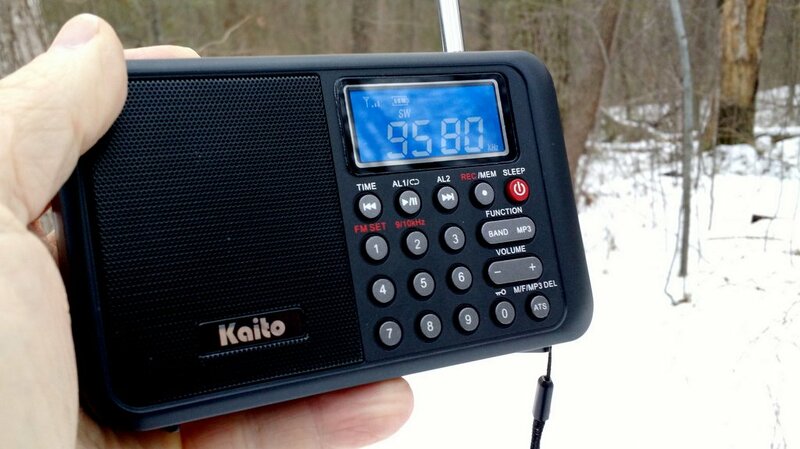 On a positive note, the Kaito KA108 has respectable FM reception. I was able to receive all my benchmark FM stations with little trouble, and the KA108 maintained a strong lock on all signals. And as mentioned above, KA108 audio via the built-in speaker is much better on FM than on any other band. Indeed, on FM, the KA108 produces rich, full-fidelity audio that can easily fill a room. Audio is similar to that of the Melson M7 and the Melson S8. If you’re seeking a nice FM portable with robust audio, you’ll enjoy the KA108. I’m quite disappointed with the KA108’s shortwave performance. Almost immediately after unboxing the KA108, I inserted a battery, walked outdoors, and tuned through the 31 meter band. Other than a couple of blow-torch North American private broadcasters, I heard…nothing. It was during this first band scan that I realized how annoying the tuning mute could be. And the audio, meanwhile, sounded muffled and garbled: I assumed that there was some local interference, and simply turned the radio off, hoping the following day would produce a change for the better. 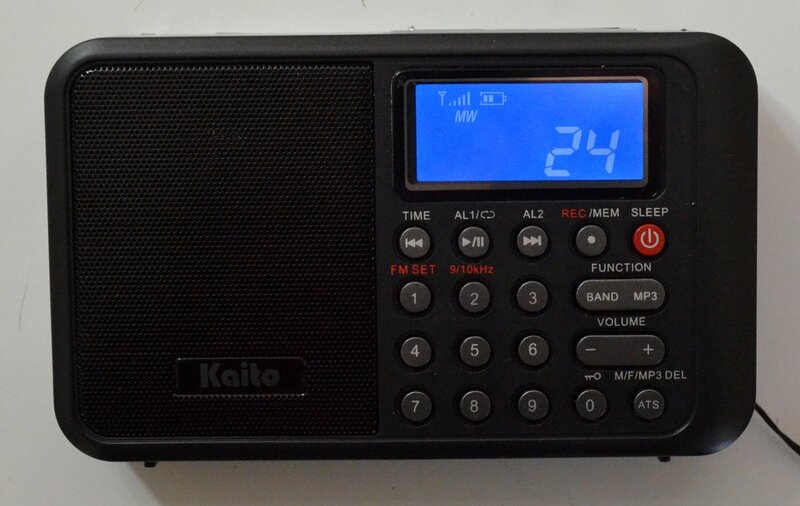 The following day, I spent a great deal of time with the KA108 on the air, and compared it with the Eton Traveller III and the Tecsun PL-310ET––both capable, similarly-priced compact DSP radios. Sure enough, when compared with other portables, the KA108’s reception is, sadly, rather poor. At first I thought it might be an issue with receiver sensitivity, but the KA108 could receive almost every station the Traveller III and the PL-310ET could receive. But the audio was so muffled on the KA108, even with the use of headphones, that spoken word was hard to interpret. Additionally, the over-active AGC (Automatic Gain Control) meant that audio levels were all over the place. That combination makes for fatiguing listening. Over the next few days with the KA108 on shortwave, I drew a few conclusions. This combination makes for sloppy shortwave performance. To save time in making the KA108’s comparison information readily available, as well as to indicate actual speaker performance, I decided to take a few quick comparison videos not with the KA108 or an external mic but simply with my smartphone. While my phone’s microphone is somewhat limited, I believe you’ll be able to observe the inherent problems with the KA108. I compared the KA108 with the Traveller III in each video. Mediumwave (a.k.a., AM broadcast band) performance is very similar to shortwave performance. In this video, I’ve tuned to an AM station located twenty-five miles away on 1600 kHz. The KA108 can receive the station, but audio is not pleasant and the AGC is, yet again, overactive. I’ve noticed that the mediumwave band is plagued by more internally-generated noise than are the shortwave bands. Note that YouTube’s copyright checking system flagged my video because it recognized the song being played in the background on WTZQ. I believe this easily qualifies as fair use since the clips are short and it’s an off-air recording with dialog on top. I’ve disputed this, but YouTube may choose to delete this video. In anticipation, I’ve saved the audio from this video–you can listen to it by clicking here. In a nutshell, AM performance on the Kaito KA108 is frankly poor. Even when I tuned to strong local stations, the audio sounded muffled and distorted, much as in the Radio Havana Cuba example above. So you can forget about using the KA108 for mediumwave DXing. There are some redeeming virtues with the KA108, however. Here’s a positive: digital playback with the KA108 is fantastic. I’ve played a wide variety of audio files on the KA108, and am very impressed with its on-board MP3/WAV player. While audio characteristics unfortunately cannot be adjusted––i.e., there’s no equalization––I find the default audio settings well-balanced for both music and voice. 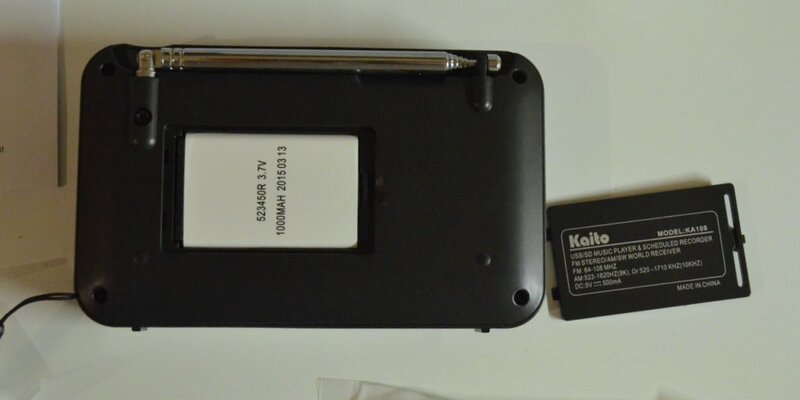 The KA108 has a dedicated MicroSD slot and a covered USB slot on top of the unit. Recording directly from shortwave and mediumwave is also quite good. I believe its on-board recorder is perhaps the best I’ve tried in recent portables; it’s a marked improvement over that of the Kaito KA29, for example. It seems to capture the receiver’s produced audio well, with only a slight, high-pitched “hiss” injected in the audio, though this is not a major distraction. Sadly the main distraction is that the recorder is recording audio, as I’ve outlined above, from a sub-par receiver. Still, as an MP3/WAV player, it’s brilliant, and boasts excellent audio. I really wanted the Kaito KA108 to be a strong––or even average––performer. Why? Because, like many of you, I would love to have a capable shortwave/mediumwave radio with built-in digital recording and playback. Sadly, the KA108 falls short on multiple levels. Concerned that I might have simply received a defective unit––as I did when I reviewed the Sangean ATS-405––I contacted Kaito Electronics USA. I mentioned my disappointment with the radio’s performance, and detailed the negatives mentioned in this review. I asked Kaito’s technician if I might have received a defective unit? He responded that my experience seems to be the norm with this particular production run. He, too, had noted muffled/garbled audio on shortwave and mediumwave. Per his request, I sent a detailed list of the KA108’s shortcomings with suggested fixes. He is planning to send this to Kaito’s current manufacturer in China. Since this is a DSP-based radio, I imagine the first four adjustments can be made via firmware upgrades. Time will tell if the second production run of the Kaito KA108 improves on the first. Fingers crossed…! Kaito, we’d like you to succeed on this score. 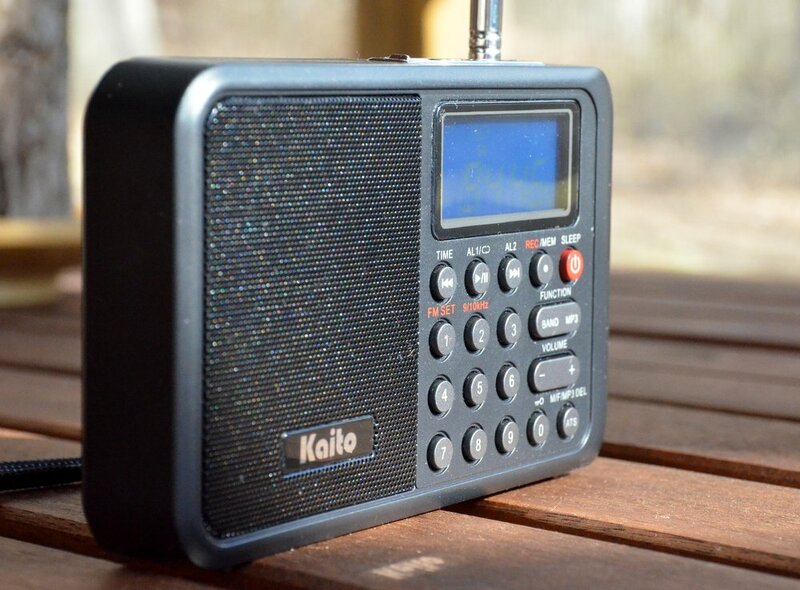 Again, many thanks to Universal Radio for supplying me with a KA108 for this review. This entry was posted in AM, FM, Mediumwave, New Products, News, Radios, Reviews, Shortwave Radio, Shortwave Radio Reviews and tagged KA108, KA108 Review, Kaito, Kaito KA108 Review, Universal Radio on January 31, 2016 by Thomas. Yesterday afternoon, I ventured off of our snowy mountain for the first time since Thursday. I was very pleased to find the new Kaito KA108 waiting for me at the post office. Universal Radio kindly dispatched a unit to me for review from their very first shipment. Thanks, Universal! I’m starting to put the KA108 through its paces: checking out reception on shortwave, mediumwave and FM. I plan to make a few recordings today and see if its internal recorder is effective (my fingers are crossed on this one!). 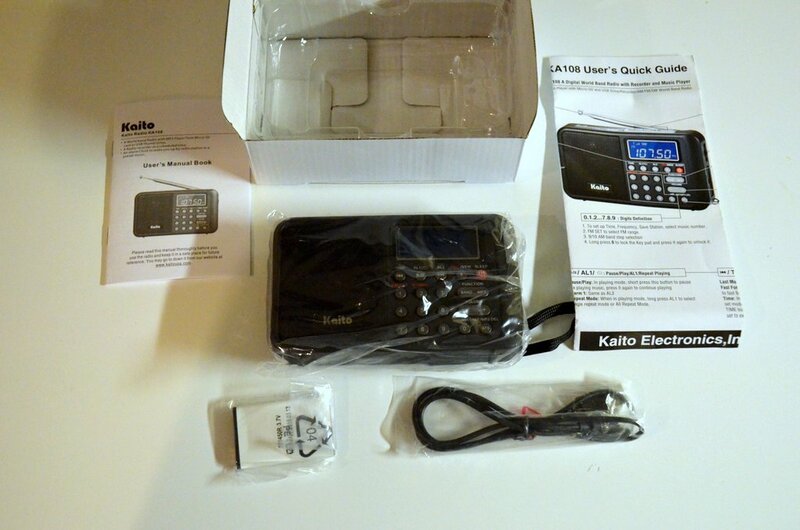 This entry was posted in New Products, News, Radios, Shortwave Radio and tagged KA108, Kaito, Kaito KA108, Kaito KA108 Unboxing on January 26, 2016 by Thomas. Looks like Kaito has a new radio in the works. Portable shortwave receiver with record function. It looks very much like some of the Eton portables. 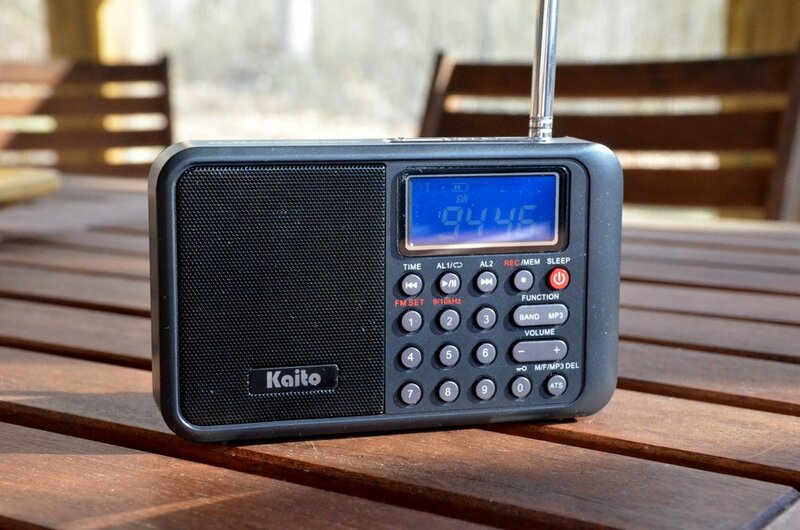 The Kaito KA108 is a great AM, FM shortwave receiver with a very special feature. It has a record function that allows you to record off the air automatically! It can save the audio to a Micro SD Card or USB Thumb Drive (not included) inserted via the top panel. It also features a large backlit display with battery indicator, signal meter and conventional alarm function with two programmable wake up times. There is a Line Input Jack and stereo earphone output jack. Power input is via a USB port. The KA108 comes with: Li-ion battery and USB charging cable. One year limited mfg. warranty. Thank you for the tip, Ante! Universal has pricing and availability listed as TBA at time of posting. I hope the “Super Sound” part means that the internal speaker is like that of the Melson S8, with an acoustic chamber. Those speakers have amazing fidelity for such a compact size. Checking this morning, the Amazon listing only has one review–a 5 star–but it wasn’t a verified purchase, had few details on performance and, frankly, smacked of shill a little too much for my taste. I certainly hope this isn’t simply a Melson S8 with a re-designed body. As I mention in this review, the S8 suffered from terrible internal noise, rendering it useless on shortwave. The Line In, Phone and DC IN 5V jacks are in the same placement and order as the S8–but the S8 also has the power button and MicroSD card on the side panel, the KA108 has the MicroSD card slot on top, along with a USB thumb drive slot. I have hope that this is not a re-badged Meson S8 because the KA108 has features the Melson S8 did not, including the ability to record and even schedule recordings! There are so few portables on the market that can record on the shortwave bands. There are no portables currently on the market that have a sensitive/selective receiver and do a good job of recording. Even if the KA108’s receiver is only average, if it has a clean recording function, it will be a keeper for me. Of course, I will certainly review the Kaito KA108 here on the SWLing Post. I will most likely wait until Universal Radio has the units in stock, which I imagine will be soon. This entry was posted in New Products, News, Radios, Shortwave Radio and tagged KA108, Kaito, Kaito KA108 on January 8, 2016 by Thomas.